This article covers the rise and fall of Brighton Beach as a leading resort between 1870 and 1920. During these years, Brighton Beach competed for supremacy of Coney Island with Manhattan Beach to its east, and West Brighton to its west. Bill Engeman and the Brighton Beach Railroad Company both placed their bets on Brighton Beach and did everything they could to attract visitors to their particular resort. 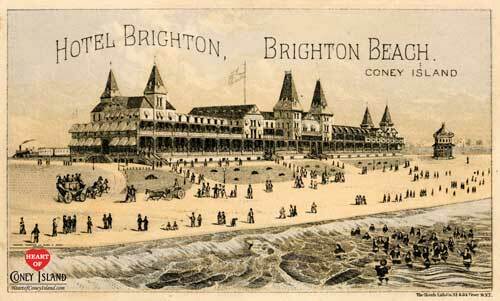 Brighton Beach was home to a beautiful hotel, music hall, and a well-known horse-racing track. When first built, it appealed primarily to the middle and upper-middle classes, while its competitor West Brighton initially appealed to the working and middle classes, and Manhattan Beach to the upper class. William A. Engeman, born in New York City in 1840, left home as a teenager to find better opportunities in the West. He worked as a carpenter and did various odd jobs, including driving teams of mules. During the Civil War, he became a millionaire by selling the Union Army large numbers of mules and horses he sourced from ranchers and farmers. Engeman returned to New York after the war, looking to settle down. Instead, he ended up embarking on a new adventure. Engeman went to see a real estate lawyer and broker by the name of William H. Stillwell about buying land in the easternmost area of Coney Island, today known as Brighton Beach (then known as Middle Division) and Manhattan Beach (then known as Sedge Bank). Stillwell specialized in Coney Island real estate because his family had lived in the area for generations. Most of Sedge Bank was held in trust by the Town of Gravesend on behalf of the heirs of Gravesend’s original founders, and hence not available for purchase (see Early Coney Island History article). The Middle Division land, however, had been distributed out of the trust between 1643 and 1769. It therefore was privately owned and could be available for sale. The problem with Middle Division was that it was split into dozens of little two-acre lots. The ownership of these little lots had become further fragmented among hundreds of descendants as inheritances took place over generations. Stillwell knew who held title only to some of the lots in Middle Division. Engeman said he wanted to buy all of Middle Division and would take care of tracking down who owned each lot. This was a daunting task in an era where communication took place by telegraph or letter. The owners were scattered around the United States and some were even in other countries. It took Engeman several years to build the complete family trees and sales records required to trace each lot's ownership. Against all odds, Engeman succeeded in identifying all of the two-hundred to three-hundred owners, and also in convincing all of them to sell. He ended up acquiring all of Middle Division, plus some oceanfront property to its west. Engeman called his land Brighton Beach. The land to its west became known as West Brighton. Perhaps the name was passed down informally by British troops who were stationed at Coney Island during the American Revolution. They may have compared it to Brighton, a famous English oceanside community. Engeman built a two-story building at Brighton Beach in June of 1870, while he was still acquiring some land. He named it the Ocean Hotel. It served both as a hotel as well as his primary residence. He was divorced and had his young son with him, as well as his half-brother, George H. Engeman. George ran an oyster house and banquet hall in present Tribeca. Engeman advertised his new Ocean Hotel in newspapers as soon as it was completed. The story of Engeman’s pier comes from a history of Coney Island that Stillwell wrote in 1884. Stillwell used the opportunity to flatter the area’s leading business owners. He sang Engeman’s praises particularly well. Perhaps the fact that by then Stillwell was working at Engeman’s company had something to do with this. By 1877, with competition ramping up at West Brighton, Engeman finally had to get serious. At this time, he began advertising both the hotel and a building called the Pier Head Pavilion which he must have erected to complement his semi-wondrous pier. Further improvements likely were made by 1879, when he advertised it as ‘Engeman’s Grand Promenade Pier’. After building the pier, Engeman rigged up an enclosure of wooden piles next to it to serve as an aquarium, a few yards offshore. Over it, he built a platform from which the denizens of the deep could be viewed by anyone willing to pay a slight charge for the privilege. He had bought eight sea lions and three large ocean-going turtles for his aquarium. The largest of the sea lions was named Bill, and his mate was called Fanny. They had two baby sea lions, or sea cubs. What relationship the other four sea lions had to Bill remains an unsolved mystery to this day. One night, a gale blew up, lashing the shore with ponderous waves, shaking the timbers of the aquarium. A pile was wrenched loose, creating an opening out of the enclosure. Bill gave a snort of astonishment and elation, and called on his companions to follow him through the aperture. The turtles also knew a good thing when they saw it, and likewise departed through the opening. Hearing a commotion, Engeman and some of his employees rushed from the hotel to the pier and beheld the empty aquarium. By the following morning, when the storm had abated, just who did Engeman see cavorting offshore? Sure enough, it was Bill and his pals. Engeman ordered some of his people to fetch a few buckets of fish from the hotel, and sent them out in a rowboat to entice the creatures back into the enclosure. The men in the boat rowed slowly towards the enclosure while the sea lions followed, gulping down the fish being fed to them. Engeman stood expectantly with a plank in his hands ready to seal the opening as soon as the sea lions had entered. Just as one of them seemed to enter, Bill let out a roar, turned, and headed out to sea, his entourage in tow. They were last seen happily disporting themselves on their way to Sandy Hook and the ocean beyond. One of the men in the boat claimed that Bill raised a fin and waved him goodbye. Another said that he heard something from Fanny that sounded like, ‘So long, Engle!’ At least, those were the accounts given at the bar that night. Engeman had several additional construction projects in mind, including a second and larger hotel, a bathing pavilion, and a racetrack. However, he had spent a substantial amount of money acquiring his extensive land holdings, and lacked the means to do everything he wanted. While Engeman was debating whether to borrow the money he needed, a financial syndicate approached him. The syndicate sought to build a railroad to Brighton Beach and a palatial hotel at its terminus. All in all, it had raised $1.5 million to invest in its potential Brighton Beach venture. Engeman would receive a substantial amount of cash and some shares in the company in exchange for a railroad right-of-way through his land and enough space for a hotel complex. Notably, there were many railroad startups like this following the Civil War, all backed by wealthy investor groups that were racing to build tracks to potential future hot spots. The first mover to a given location often could expect to monopolize the route, given the high costs of building railroads and the fixed cost economics of the business. The idea of building a hotel at the terminus was typical, as it gave passengers something to do at the beach when they arrived. It was rarer to do what Engeman had been planning, namely building a resort without also controlling the means transportation. Diversified railroad owners were known to extort individual resorts by threatening to raise fares and choke off passengers. The backers of the Chicago World's Fair of 1893 would learn this the hard way, when railroads monopolizing East coast passenger traffic refused to lower train fares to attract more visitors to Chicago. Engeman accepted the proposition, giving him the money he needed to build a bathing pavilion and a racetrack. His Ocean Hotel would remain where it was, on the west side of the new hotel. He would build an even larger bathing pavilion than he had intended, to accommodate the crowds arriving on the new railroad. 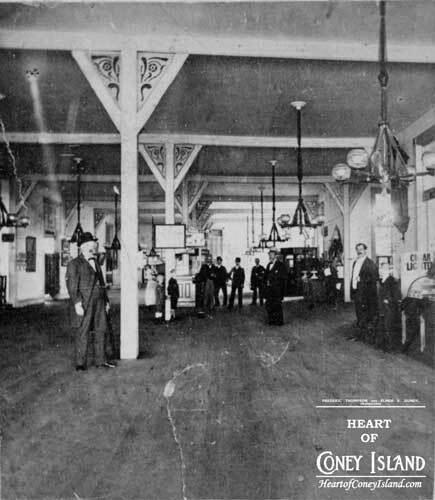 His agreement with the Brighton Beach Railroad Company gave him exclusive rights to build this bath house next to the company’s Brighton Beach Hotel in exchange for a portion of his revenues. The syndicate that made Engeman the offer incorporated as the new Brooklyn, Flatbush and Coney Island Railroad. Most people referred to the railroad as the Brighton Line. It began operation on July 1, 1878, shortly after completing its Brighton Beach Hotel and just in time for the popular July 4th weekend. The Brighton Line only went as far north as upper Brooklyn from Brighton Beach. To draw more passengers, it made a pact with the larger Long Island Railroad ('LIRR') to connect with LIRR passengers at the LIRR's Flatbush Terminal (Flatbush Depot in the trade card). The Brighton Line company erected a magnificent hotel next to Engeman’s Ocean Hotel, just as it had promised. This Brighton Beach Hotel, also known as the Brighton Hotel or Hotel Brighton, was one of three large, elegant and famous hotels that would be erected at Coney Island. The other two, the Manhattan Beach Hotel and Oriental Hotel, opened at upscale Manhattan Beach. Each functioned as a standalone resort while allowing patrons to venture into the action at neighboring West Brighton. 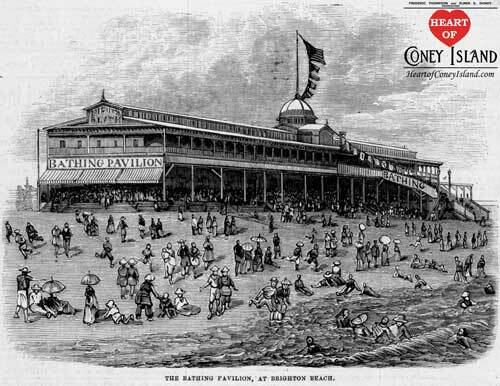 The Brighton Beach Hotel was located on the west side of Coney Island Avenue, about fifty yards south of the present boardwalk. At the time, the beach extended out significantly further than it does today, so the hotel’s location was still 150 yards shy of where high tide reached along the beach. The hotel catered to upper middle class Brooklynites and their families. Recall that back then, many of the wealthier New Yorkers lived in Brooklyn Heights, not Manhattan. In 1880, a room without any included meals at the Brighton Beach Hotel cost between $2 and $5 per night. For perspective, laborers were making about $1 a day and a multicourse dinner with wine at a higher-end restaurant would run about $1.50 per person. The Brighton Beach Hotel was a nice place. The Brighton Line company preferred to lease the Brighton Beach Hotel to an experienced operator rather than to operate the hotel itself. The first lessees were Breslin and Sweet. Sweet owned a high-end seafood restaurant on Fulton Street in the South Street Seaport neighborhood of Manhattan. The Brighton Beach Hotel was approximately 500 feet long on its ocean-facing side (accounts vary from 450 feet to 525 feet), between 125 to 150 feet deep, and varied in height from three to five stories. The main floor had a wide porch and the second floor had a veranda, both of which ran along the entire front of the hotel, as well as its west side and part of its east side. The three-hundred to four-hundred rooms and suites (reports vary), all above the main floor, could be reached by elevators. The rooms were carpeted and neatly furnished. Each had its own bathroom and was heated by steam sent up through a vent in the floor. Guests could enjoy gas lamps and running water in every room. This combination of amenities was very high end at the time. The main entrance of the hotel faced south, towards the ocean. 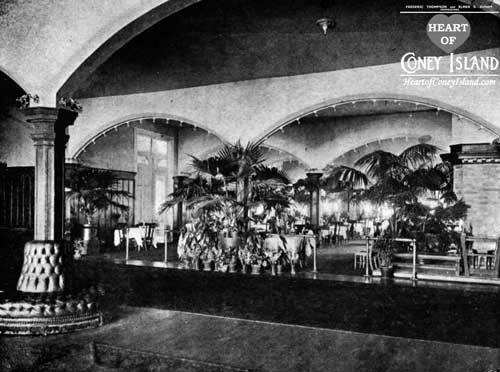 At the northern end of the lobby was a popular, 175-foot long bar. Elsewhere in the lobby were lounges, a florist shop, a beauty salon, a tonsorial parlor, a confectionary shop, an ice cream parlor, a ballroom, a card-playing room, a railroad ticket office, a telegraph office, and billiards room with sixteen tables. Maurice Daly, the billiards world champion, was hired to give lessons and entertain guests full-time. The basement housed the kitchen, an ice room and three bowling alleys. The building also had its own sewage treatment plant. Dining rooms were located on each wing of the lobby. One was for registered hotel guests, who were served table d'hote, and the other for temporary diners, who were served a la carte. The latter system was favored by those with gargantuan appetites, like 'Diamond Jim' Brady, who would gorge himself by ordering his favorite main course several times in one sitting. String orchestras would play in each as patrons dined. Sections at both ends of the veranda, known as piazzas, were set aside for outdoor dining. Along with the indoor facilities, the hotel could accommodate approximately 2,000 diners at one time. The covered piazzas were particularly popular on warm summer days because of the cooling ocean breeze. People were expected to wear proper attire in a dining room back then. Men, women and children came to Coney Island dressed in their Sunday best, even in the middle of summer. The men wore suits, white shirts with starched white collars, ties, high buttoned shoes, and hats. Up until around 1900, Panamas and bowler hats, or ‘kellys’, were the vogue; after that, fashion favored round, stiff straw hats. The ladies likewise came adorned in all their finery. Young ladies looked fetching in their all white dresses, shoes, and stockings, with silk sashes tied around their waists in a bow, large floppy hats on their heads, and a colorful parasol to protect their skin from the sun. About thirty yards in front of the hotel's entrance was a bandstand shaped like a half-shell, conveniently called the ‘bandshell’. It was the first of its kind in the country. Conterno's band and Jules Levy, the world renowned cornetist, performed in it the first season. Subsequently, Neuendorff's fifty-piece symphony orchestra and Ballenberg's Cincinnati Band entertained there as well. During the 1890s, when religious ‘reformers’ were doing their best to make everyone’s life on Coney Island rather miserable, bands were forced to play religious music on Sunday mornings. North of the hotel, towards what is now Brighton Beach Avenue, were carriage houses, stables, and a lawn for croquet and archery. South of the hotel, towards the beach, were paved walks lined with manicured flower beds. At night, the walks were illuminated by Chinese lanterns, and by gas and electric lights enclosed in colored globes. At the southeast side of the hotel was a circular building which contained a doctor's office and a pharmacy. There were also some swings for children nearby. South of the bandshell was the beach. At that time, it was not protected by the present jetties. Waves would roll in at wide angles and wash the beach flat. At low tide this created a broad, level area known as the Strand. Early photographs and drawings show many people in carriages and on horseback riding along the Strand, which the ocean would eventually wash away. Engeman set out to build a splendid bathing and entertainment complex capable of handling the expected crowds. He located the pavilion approximately one hundred yards east and 150 yards south of the Brighton Beach Hotel, near the high water mark. The pavilion was between 400 feet and 490 feet long (accounts vary) on its ocean-facing side. It featured two stories above ground, a basement, and two large terraces spanning its entire front and sides. To get a feel for the size, the ground floor terrace alone was fifty feet wide, and the upper floor’s terrace was thirty feet wide. Engeman began construction in May of 1878 and rushed to finish the pavilion in time for the hotel’s opening. By June, the pavilion was functional, but the ground floor was still unfinished. Visitors could see the supporting piles. After the season’s end, Engeman finished construction by enclosing the ground floor with wooden siding and building it out, along with an addition, ahead of the 1879 season. The finished ground floor contained a restaurant, bar, billiard room and shooting gallery. Additional rooms housed the popular Midget’s Palace and Bunnell’s Museum. The former featured a group of musical midgets known as the Lilliputian Opera Company. Bunnell’s was a type of venue known as a ‘dime museum’. These showcased oddities, charged ten cents admission, and were considered quite normal and didactic at the time. The bathing pavilion show featured typical crowd-pleasing duos such as a 500-pound boy presented next to a ‘living skeleton’, and an eight-foot-tall giant hanging out with a dwarf. The basement housed the kitchen, an ice room, employee dormitories and overflow bathing rooms. The upper floor initially had locker facilities for six-hundred bathers, expanded to twelve-hundred for the second season. Ladies’ lockers were on the east, and men’s on the west. It also had special rooms in which there were hot salt-water baths for the convenience of those seeking relief from arthritic or rheumatic afflictions. From the upper floor, two ramps, one for women, the other for men, led down almost to the high water mark of the surf. The reason for the ramps was to avoid the mess of having dripping and sand-smeared bathers trudging through the dining area of the lower floor. To handle the large number of bathers, which could exceed 6,000 in a single day, the bathhouse kept an inventory of 12,000 bathing suits and 30,000 towels. Large laundry facilities could wash and quickly steam-dry returned garments for the next patron. At night, eight-thousand gas jets lit up the pavilion and surrounding grounds. Around one dozen electric lights were used to light the beach for the popular pastime of ‘nightbathing’. Photographs in those times show men, in full street attire, standing or sitting on the sand, usually appearing somewhat disillusioned by what they saw. The women were clad from neck to knees in loose-fitting, dark-colored, double-skirted bathing suits, usually rented, and walked along the beach wearing shapeless hoods over their heads, fastened under the chin by an elastic. This was not a modern Las Vegas pool party. The elegant high-heeled shoes and pearls and tightly-strapped corsets that created hour-glass figures would have to wait until the evening. The beach boys in those days, meanwhile, sported handlebar mustaches and potbellies. The size of latter indicated the degree of their prosperity, leading the women were none too pleased, either. The men wore one-piece, form-fitting, wool flannel bathing suits, in dark blue or maroon colors to resist fading. If they had their own suits, they would run the suit through a hand-cranked wringer at the bath house afterwards. In 1879, Engeman finally got around to building his racetrack. He named it the Brighton Beach Fair Grounds, though most people knew it as Engeman’s Race Course or the Brighton Beach Race Course. This mile-long track was in back of the Brighton Beach Hotel, and ran between the present Coney Island Avenue, Ocean Parkway, Brighton Beach Avenue, and Sheepshead Bay Road. The latter no longer exists, and stood about thirty yards south of Neptune Avenue, running parallel to it. During the racing season, Engeman's track operated every day except Sunday. The entrance, grandstand, paddock, and other track buildings were at the southern end, along Brighton Beach Avenue. The entrance was toward the west end, near Ocean Parkway. The Brighton Railroad also had its terminal along Brighton Beach Avenue and on rails to its south. Horse racing at the time was the dominant sport and a national pastime. Pari-mutuel betting was legal and regulated by the New York State government, but many bettors preferred bookies because they gave better odds. Bookmaking was illegal, but Engeman and other track owners permitted the bookies to function in booths if they paid for the privilege and didn't cheat the bettors. How could bookies take bets openly at the track when it was against the law? Quite easily, if you had someone like John Y. McKane running the town. In fact, the McKane Construction Company built the booths for the bookies at Engeman's track. Even if the district attorney egged on the Brooklyn city police to arrest the bookies and Mr. Engeman, a jury would never convict; any jury of twelve good men was bound to include several horse players. And what jury would convict Engeman, whose million horses had helped General Ulysses S. Grant save Union? Clearly this patriotic gentleman had built his track to improve the breed, so that America would have the best cavalry in the world during the next war. And if worst came to worst, a man like Engeman would certainly know another man, who would know a politician, who helped the judge and district attorney to get their jobs. The reformers gnashed their teeth in frustration and warned bettors, in sermons and editorials, that the races were fixed. Every horse player already knew this, which is why many of them bet only on long-shots. The possibility of a fix was just another factor to consider in placing bets, along with the horse’s history, weight that the horse was carrying, the track conditions, and the length of the race. The bettors were accustomed to all kinds of shenanigans in the era before saliva tests, and took it all in stride. One of the recurring themes throughout Coney Island history is natural disasters continuously laying ruin to even the most carefully constructed buildings and business plans. Fires, storms, floods and hurricanes were just a part of life. Storms back then were more devastating to Coney Island than today. First, there were no stone jetties jutting into the ocean to break the force of waves coming in at an angle, which flattened the beach in their outflow. Second, Rockaway Point (also known as Breezy Point), which nowadays protects Coney Island from the ocean’s full force, was then further east. The western end of Rockaway has been accumulating sand and growing southwestward, through some quirk of nature, at the rate of about two hundred feet a year, so that in the past century it has grown some four miles in the direction of Sandy Hook. Bulwarks were erected along the beach in front of buildings as a defense against storms. A typical bulwark might be twenty-five feet deep. The first twenty feet consisted of wooden posts, called piles, implanted vertically deep into the sand in a grid-like pattern. Behind them was a solid wall of wooden planks five feet deep. These bulwarks broke up the force of oncoming waves during storms, lessening their strength and the damage done to buildings further ashore. A bulwark defense system was erected at Brighton Beach during the winter of 1880-1881. Neighboring Manhattan Beach did a little better, backing the piles with boulders for additional support. In March of 1881, waves from a powerful storm leaped over these seawalls and washed away the lawns and auxiliary buildings of the great hotels, but the piles themselves fortunately remained in place. The surf swirled around menacingly under the high stilts under Engeman's Bathing Pavilion. Nearby, it demolished the shuttle railroad that ran along the beach between Manhattan and Brighton Beaches, which had to be hurriedly rebuilt in time for the new season. Engeman's Ocean Hotel, west of the Brighton Hotel, was battered. Engeman subsequently installed a double row of piles to further shield his property. Nothing could shield his wooden pier, however, which took a bad beating and had to be repaired. In West Brighton, the Iron Pier at West 8th Street, and the New Iron Pier, then under construction, at about West 5th Street, were undamaged. In the early 1880s, Brighton Beach was still considered ‘the very heart of the Island’, as mentioned in a popular guide book. The Concourse, which connected Engeman’s Ocean Hotel to Culver Plaza in West Brighton, was a well-maintained, asphalt-covered road. The extension of the Concourse west of Culver Plaza was known as Surf Avenue. It was a simple gravel surface, reflecting the relative hierarchy at the time of West Brighton and Brighton Beach. West Brighton was nonetheless steadily gaining adherents, and in 1881, Surf Avenue was extended to West 17th Street. By the following year, it reached Norton’s Point at the west end. Its extension was one of the first tangible signs of West Brighton’s gradual rise. During the five years after the opening of the Brighton Line and the Brighton Hotel, much was changing at Brighton Beach, and not for the better. At the end of the 1883 season, both the railroad and hotel had dilapidated to rather shocking condition. Water leaks on the hotel’s top floor had gone unrepaired and were now trickling down multiple levels. The hotel had never been repainted since its opening. Bookies were operating out of a room in the basement, which was not in keeping with the hotel’s original character. Increasingly worried guests noticed that on a typical day, the ocean would surround the drugstore and other smaller buildings in front of the hotel during high tide, almost reaching the hotel itself. And as for the railroad, only one of its locomotives was working reliably. People were quick to label the Brighton Line’s management as incompetent. A closer look reveals that management faced an almost impossible task. The ongoing repairs necessitated by Mother Nature’s frequent lashings at Brighton Beach were too costly for the business model to be profitable. Every time a significant storm hit, the minimum expected damage was a washout of smaller structures close to the beach as well as a complete loss of the lawn and gardens in front of the hotel. A major storm could reasonably be expected to seriously damage or even destroy some of the larger structures. Protective piles and bulwarks constantly had to be repaired and repositioned. Most importantly, every few years, the aggressive beach erosion at Brighton Beach forced the company to have to tear down and rebuild its beachfront structures further inland, plank by plank. These were issues that West Brighton did not face, and that the naturally better-shielded Manhattan Beach shared only to a lesser extent. Management should instead have been faulted for placing a crippling amount of debt on the company at inception. Of the $1.5 million invested by the Brooklyn, Flatbush and Coney Island Railroad, only $0.5 million was equity. The remaining $1.0 million was mortgage debt carrying 7% annual interest, totaling $70,000 per year. The company generated almost all of its revenues during the summer. If the weather fully cooperated, it was called a ‘good season’, and combined railroad and hotel revenues for the year totaled $100,000 to $125,000. If a storm hit or several weekends of the 10-weekend season were rainy, it was a ‘bad season’ and revenues totaled as little as $50,000. These figures were before expenses, which would run in the $65,000 range for the season from April 1st to September 30th, excluding extraordinary events. The $70,000 of additional interest payments was crippling the company. In late 1883, for the first time, the company had to borrow money to make interest payments on existing bonds. Management simply had no money for anything beyond basic upkeep. People were already talking about the good old days when the Brighton Beach Hotel had been the place to go. Throughout this period, Bill Engeman had managed his bath house, pier and racetrack competently. The racetrack in particular could be credited with drawing many patrons to the nearby Brighton Beach Hotel. On January 11, 1884, Bill Engeman died of Bright's disease. He was only forty-five. Bill’s half-brother, George, assumed management of the valuable estate, because Bill’s son was still a minor. George faced his first challenged just one week later. On January 18, 1884, the gale winds and wild surf from a snowstorm tore up all the planking of Engeman's pier and many of the piles supporting the structure. Engeman's Ocean Hotel, which was further inland and on the west side of the Brighton Hotel, was saved by a bulkhead that Bill Engeman had built in front of it, as well as barrels of hardened cement and a wall of sandbags. Meanwhile, some of the pier’s piles had broken loose and floated further east, and were now being hurled against the piles supporting Engeman’s Bathing Pavilion. The pavilion trembled with each impact, sending the caretakers fleeing for their lives. Though damaged, the pavilion survived the pounding. Engeman's Pier, however, was destroyed. As happened during the storm in March of 1881, the Brighton and Manhattan Beach Hotels had their lawns washed away, and Corbin's shuttle railroad between them was destroyed. Corbin again had to bring in pile-drivers to restore the bulkhead to protect a new railbed further back on the beach. Elsewhere along Coney Island the damage was minimal. 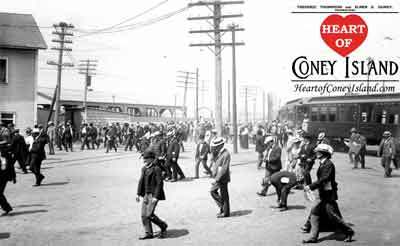 Austin Corbin, who controlled neighboring Manhattan Beach and a network of New York railroads, had been wanting to put the hurt on the Brooklyn, Flatbush and Coney Island Railroad company for some time. When he took over the Long Island Railroad (‘LIRR’) in 1883, he finally had his chance to put the company out of its misery. The Brighton Line relied on passenger traffic connecting with it through the LIRR’s Flatbush Depot. The two railroads had a contractual sharing agreement for its use. Corbin did not renew the sharing agreement in late 1883. In spite of its condition, the Brighton Line was a still a convenient railroad because it went directly from the heart of Brooklyn to Coney Island. Yet, unable to use the terminal, and with no other way to attract traffic, the overall company could not operate. There is a story that earlier, likely during the 1883 season, Corbin had already tried to put the squeeze on the Brighton Line by trying to revoke its right of way rights. The Brighton Line threatened to hit back by shutting down the shuttle between Brighton Beach and Manhattan Beach, which would leave Manhattan Beach isolated from both Brighton Beach and West Brighton. The Brighton Line also threatened to build a fence between the two properties, extending into the ocean. Apparently, this was enough for Corbin to delay his tactics for a little bit. 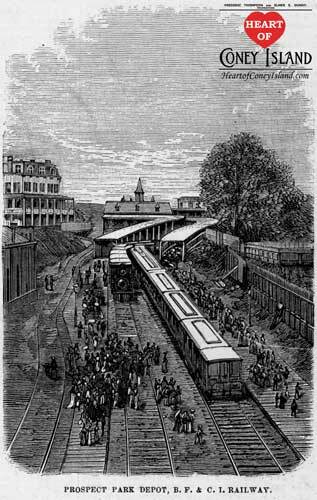 In any case, the Brooklyn, Flatbush and Coney Island Railroad Brighton Line went into receivership on January 27, 1884. Gordon Ford, its president, had submitted his resignation several weeks earlier but was asked to stay on until a receiver was selected. In late January of 1884, General James Jourdan was appointed by the courts to serve as receiver for the Brooklyn, Flatbush and Coney Island Railroad. Receivers were temporary trustees appointed to turn around bankrupt businesses in situations where creditors believed the business was worth more to them if it continued to operate rather than liquidate. After a period, the various creditors would then agree on what the business was worth, typically trade in their old debt for a combination of a lesser amount of new debt and the new company’s stock, and bring the company out of bankruptcy as its new owners. Jourdan was the current police commissioner for the City of Brooklyn at the time of his appointment. Borrowing a page from McKane’s book on career management, Jourdan was also the current Chairman of the Executive Committee of the Brooklyn, Flatbush and Coney Island Railroad. In his spare time, he also fulfilled his duties as vice president of the Kings County Elevated Railway Company. Around March of 1884, Jourdan resigned as police commissioner to focus on his burgeoning railroad career. Apparently, the demands of being promoted to full-time receiver were too great to add to all of his existing duties. 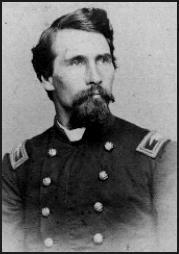 Jourdan’s qualifications for the role appear to have been primarily his political connections, which substantially surpassed his knowledge of running a railroad or resort. Jourdan was part of Brooklyn’s social elite, having risen to the rank of major general in the Union Army. A leading member of the Democratic Party in Brooklyn, his name came up frequently as a potential candidate for mayor. Proponents credited him with helping to successfully reorganize the Smith Street Railroad previously. Regardless, Jourdan immediately set out on an ambitious plan to reinvigorate the railroad and hotel in time for the 1884 season. He requested and received approval to borrow an additional $100,000 to make improvements. Several large shareholders had not wanted to inject more money into the company themselves. By late April, a new railroad terminal was being erected in Bedford to replace the LIRR loss. By late May, locomotives had been repaired and were running on the Brighton Line every half hour from the new station. Passenger cars were painted with a dark red formula known for its durability. The Brighton Beach Hotel likewise received a fresh coat of paint. Bookmakers were kicked out of the hotel, and the basement itself, which had flooded during the prior winter, was repaired. A separate company had also agreed to install a small new bathing pavilion of just one-hundred rooms in front of Engeman’s Ocean Hotel. For this and the following two seasons, Jourdan hired multiple seasoned operators to run the Brighton Beach Hotel under his charge. A number of them had worked at the hotel under Breslin, the original lessor, and had subsequently established successful careers at other leading east coast resorts. By now, the encroachment of the ocean was surrounding the pavilion with knee-deep water during high tide, and waves were hitting the building during storms. Engeman had the Brighton Beach Bathing Pavilion moved back from the ocean by 150 feet during the winter of 1884-1885. The entire structure was dismantled and reassembled on a new foundation, and the old foundation was removed and the cavity was filled in with sand. Shortly thereafter, during a storm on February 16, 1883, the ocean almost reached the hotel’s entrance at its new location. Engeman implanted a new line of piles close to the building, with ramps running down the barrier toward the ocean. Meanwhile, General Jourdan was looking for creative ways to drive more business and decided to keep the Brighton Beach Hotel open during the winter of 1884 to 1885. He had studied comparable resorts at Cape May, Atlantic City and Old Point Comfort and noted that some hotels were able to make a go of it. Given the 3.5 million people in the New York City area at the time, Jourdan thought the experiment worthwhile. Some seasoned Coney Island veterans must have chuckled as Jourdan tried his hand at a proposition they were already all too familiar with. The key selling point to potential visitors was that Brighton Beach was a full twelve degrees warmer than Fifth Avenue in Manhattan during the winter. In the northeast, because of ocean currents, the water temperature varied inversely with the seasons. The ocean cooled the surrounding air during the summer, and heated it during the winter. The risk, however, was that while patrons could not cool their homes effectively in the summer, they could heat them efficiently in the winter. Plus, adding twelve more notches on a New York City thermometer was still really cold, so people would have to remain indoors anyways. As a result, winter business had always been difficult at Coney Island, and the Brighton Hotel would face the nebulous task of having to offer guests something they could not get elsewhere. Jourdan opened the east wing of the hotel, noting that ‘the east wing is a hotel in itself, being separate and having all necessary adjuncts and conveniences’. The entire wing was heated with steam radiators, and forty rooms were made available. The eastern veranda was enclosed with sliding glass windows and decorated with flowers, shrubs and vines. Hoping to attract large parties, he offered to turn the east dining room into a dance hall measuring 60 feet wide and 150 feet long, upon request. While there were not many check-ins, the restaurant did a fair amount of business on weekends, the train ran every half an hour, and the bar was well patronized. 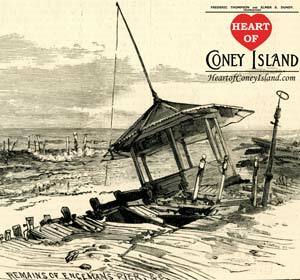 Also that winter, on February 16, Coney Island was hit by another fierce storm, which washed out to sea many small beachfront establishments. The larger hotels did not sustain damage beyond the usual lawns and flower beds being ruined. At high tide, during the storm, the surf lapped almost to the entrance of Engeman's recently-moved bathing pavilion, which led Engeman to implant a new line of piles close to the building, with the ramps running above the protective barrier onto the beach. Brooklyn Jockey Club (1893). Horse racing was the national pastime. ​Engeman’s Race Course got some new competition during the 1886 season from the recently-opened Brooklyn Jockey Club. The latter was located further north, near the Gravesend Town Hall, within the bounds of Gravesend (McDonald) Avenue, Ocean Parkway, Kings Highway, Avenue U, and Johnson Lane. The owners of the track were two brothers, Michael and Philip Dwyer, who had prospered during the Civil War in the wholesale meat business. While this track did not draw the swells that patronized the fancier Sheepshead Bay's Coney Island Jockey Club at Manhattan Beach, it attracted capacity crowds of middle class bettors of the type to be found at Engeman's Brighton track. Jourdan was having so much fun running the bankrupt company that rumors began circulating regarding if he ever intended to actually exit bankruptcy. After all, as receiver, he could invest and build without getting hassled too much for interest payments by annoying creditors, all in the name of improving the business’ long-term value. A lawsuit hit in July of 1886, claiming that Jourdan was intentionally prolonging the receivership period and to fatten his own wallet. The plaintiff claimed that Jourdan had already collected a princely sum of $14,400 over two years for work that should have only taken one year; Jourdan scoffed that he had only collected a $2,500 in annual salary and that the rest was a bookkeeping offset against other expenses. It appears that Jourdan was correct, though he certainly did seem to be taking his time and enjoying the process. Jourdan and the press had lambasted prior management for incompetence, but Jourdan’s own record now showed that he could not do any better. As of November of 1886, he was still unable to repay the $100,000 loan the company had taken to get back on its feet in early 1884. Of course, Jourdan had a litany of excuses. Jourdan blamed three consecutive ‘bad seasons’ of cool weather and ocean storms, coupled with Coney Island’s ‘wicked reputation’, for making it impossible. Reports more succinctly stated that ‘the receiver is powerless and the future [of the company] is uncertain’. At least Jourdan’s winter operations had finally broken even during the prior winter. The stock of the Brooklyn, Flatbush and Coney Island Railroad company at this point had no value; the $500,000 of second mortgage bonds traded at twenty-cents on the dollar; and the $500,000 of first mortgage bonds traded at close to face value, while being junior to the $100,000 of debtor-in-possession certificates that Jourdan had issued in 1884. 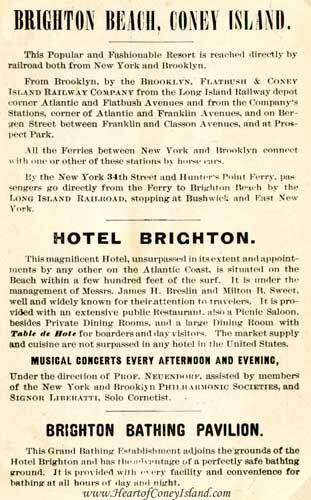 The Brighton Line and Brighton Beach Hotel were purchased at auction by the second mortgage creditors for $601,000 on August 25, 1887. Jourdan once again emerged as its president (sources show it was either concurrently or almost immediately thereafter). Langford, who had somehow represented this same group of creditors during negotiations in spite of being an officer of the overall company, was rewarded with the combined executive roles of secretary and treasurer. 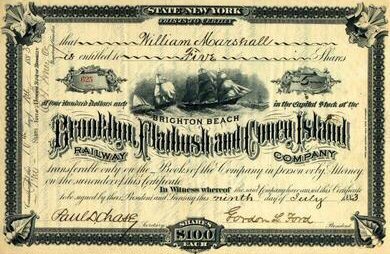 The company officially emerged from bankruptcy as the new ‘Brooklyn and Brighton Beach Railroad Company’ after final payment and approvals were made on October 26, 1887. What do you do when water erodes the coastline to the point that the Atlantic Ocean is creeping up to your luxury hotel’s front porch during high tide? Such was the question facing Jourdan, Langford and the directors of the new Brighton Beach Railroad Company as they purchased the old Brighton Line company out of bankruptcy. They decided to invited reporters to watch them attempt one of the most seemingly outlandish engineering feats of the era. There were two traditional choices. They could either raise the level of the beach by bringing in more sand, or move the hotel another 600 feet back from the shore. Dumping sand on the beach would be a temporary solution at best, because the currents and storms would quickly sweep it away. Yet, taking the massive hotel apart plank by plank and reassembling it at a new site would be very costly and time consuming. Colonel Langford came through with the winning idea. Given that the Brighton Line was, after all, a railroad company, could the hotel somehow be dragged back by locomotives, all in one piece? The structure was almost 500 feet wide, 150 feet deep, and weighed about 5,000 tons. Smaller buildings had been moved from one foundation to another, but nothing had ever been attempted on such a scale. A house-moving company, B. C. Miller and Sons, thought they were up to the challenge. Their engineers excavated small sections of the foundation along the entire length of the building, and installed hydraulic jacks supported by large wooden blocks. After the building was supported by these jacks, the rest of the foundation was removed. Twenty-four railroad tracks were laid under the building and northward, and flat-cars were rolled under the hotel on each track. The jacks were then lowered in perfect synchronization, placing the entire hotel onto the flat-cars. A test run to move the hotel was made on December 29, 1887. A steel cable was placed parallel to the hotel. Thick ropes were run from each of the flat cars to the cable, and three tons of other ropes ran from the cable to two sets of three locomotives further inland. The two sets of locomotives had to pull in perfect unison, as even a small discrepancy in speed or timing could severely damage the wooden hotel. On signal, the locomotives and the hotel crawled northward together, amid cheering crowds, whereupon the signal was given to halt. An examination ascertained that there had been no structural damage to the building. For the rest of that winter, after another partial move forward, the Brighton Hotel remained on the flat-cars, waiting while a new foundation of piles and bricks was prepared about a hundred yards to the rear of the old site, as well as new water and gas pipes. On February 25, 1888, a gale carried the surf almost to the new foundation. Newspapers reported that ‘the ocean has almost seized its prey at Coney Island’, and that both the Brighton Hotel and Engeman’s Ocean Hotel seemed to be ‘very shaky hotels’ given the surf. Following the storm, the heads of the Brooklyn and Brighton Beach Railway debated if they should move the new foundation even further back. The tradeoff for the additional safety was that the hotel would be much hotter. Air conditioning in those days was nothing more than the cooling ocean breeze, which was stronger at the water’s edge. Being close to the ocean also meant that the high tide water cooled the sand in front of the hotel, instead of allowing it to bake all day in the sun. Builders often tried to get the best of safety and cooling by building their hotels atop piles positioned in between the low and high water mark of the tides; a boardwalk also built on piles allowed guests to walk to dry land further inland during high tide. These owners preferred to face storm damage than risk losing guests to a sauna-like interior. Given how quickly the beach eroded, Jourdan decided the only sensible move was to proceed with relocating the hotel. The feat took place in May of 1888. A new bulwark of wooden piles was built a distance in front of the hotel, new gardens were laid out, and a boardwalk was constructed to Ocean Parkway. By this time, the Concourse was under water in Brighton Beach even at low tide. The Brighton Beach Railroad Company erected the Brighton Beach Music Hall on the west side of the newly-relocated Brighton Hotel in time for the 1888 season. This attractive theatre was pretty spectacular for the era. It was a two-level, steel, brick, and glass structure, with side-sliding windows that could adjust to weather conditions. A canvas canopy covered a passageway between the hotel and the theatre. About eighteen-hundred seats were available in the theatre for those paying seventy-five cents to enter, quite a hefty admission fee for those times. Anton Seidl, the principal conductor at the Metropolitan Opera House, was hired to perform for the inaugural 1888 season, which coincided with the opera house’s summer offseason. Jourdan hired Seidl to replace Cappa’s Seventh Regiment Band, which had played at the Brighton Beach Hotel during prior seasons. Seidl was a big deal and the hope was that he give Manhattan Beach’s band, led by the exceptionally popular Patrick Sarsfield Gilmore, a run for its money. Seidl, however, did not come cheap. He received a thousand dollars a week, a free suite for himself and his wife, and an additional $2,500 a week for his sixty-seven-man orchestra. His contract was for two performances daily, seven days a week, for the ten-week season. Altogether, the cost of the summer concerts came to some $35,000. These were considerable sums, both relative to the company’s revenues and in absolute terms; the buying power of a dollar at the time was at least twenty-five times what it is today. Seidl had recently come from Germany and was a friend and admirer of composer Richard Wagner. His initial concerts started with familiar excerpts from such great composers as Beethoven, Berlioz, Massenet, Delibes, Liszt and, of course, Wagner. As the season progressed, people began to note that Seidl seemed to be playing a lot more of his friend Wagner, and a lot less of other composers. 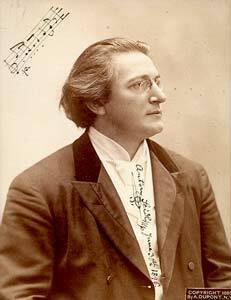 One critic wrote, ‘too much Wagner causes torpidity of the liver’. Another critic commented that long passages from Wagner were fine in their place, but did not mix well with the light entertainment most people sought from more typical bands at the beach. Anyone who has listened to a baritone and a basso bellowing at each other for over a half an hour, as in the first act of Wagner's Flying Dutchman, can sympathize with these observations. Customers asked Seidl to start advertising his playlists in advance, to decide if it was worth the trek to Brighton Beach to hear his concert. Seidl, being an artist and not a businessman, ignored the critics, the customers and the incredible $20,000 loss incurred at his concerts in the music hall’s inaugural season. For the 1889 season, the Brighton Hotel came under the new management of Breen and Thomas Cable, who had operated Cable Hotel at Culver Plaza North. Cable ran the restaurant; Breen ran the front of the house. Alongside Jourdan and Langford, they group decided that Seidl’s services were no longer needed. A group of society ladies came to Seidl’s rescue when they heard that their ‘angel’ was being shown the door. Their newly-formed Seidl Society entered into a multi-year contract to subsidize the maestro's performances at the Brighton Beach Music Hall. Just as its fundraising was predictably falling a bit short, Ms. Laura Holloway, its leader, became romantic with none other than our very own most eligible bachelor, Colonel Langford. After Langford and Holloway were married, Langford came to better appreciate Seidl. Seidl and his orchestra were always paid on time in spite of ongoing financial strains at the property. The subsidized economic arrangement was also enough to suit Cable and Breen, who were trying to attract classy, high-toned society types back to the Brighton Hotel to bring back the good old days. The partners did, however, force Seidl to post his playlists one week in advance, so that concertgoers would know what they were signing up for. When George Engeman was interviewed following the storm of February 1888, he stated he would ‘under no circumstances’ move his Ocean Hotel further back. He seemed to imply that the perennial beach erosion at Brighton Beach was due for a favorable reversal that would start adding sand back to the beach. The skeptical reporter asked a few more questions and then must have just shrugged and walked away. Engeman apparently ended up thinking the better of it, too. Shortly after the Brighton Beach Hotel was relocated and the Brighton Beach Music Hall had been built, he decided to move the Ocean Hotel. The only trouble was that because he had delayed, the Brighton Beach Music Hall had been built on the west side of the Brighton Beach Hotel, where the Ocean Hotel would have been. So, Engeman had to move the Ocean Hotel back diagonally, to the west side of the music hall. Engeman also planned to move back the Brighton Beach Bathing Pavilion once more, as he had already done in late 1884. Ongoing beach erosion had already resulted in the typical high tide threatening the building at its new location. However, he put this off until the following year, to focus on building a pyrotechnics park to compete with Pain’s at Manhattan Beach. Engeman had already built some stands and was presenting a Civil War show called ‘The Capture of New Orleans’ between what is now Brighton Beach Avenue and Neptune Avenue, east of Coney Island Avenue. Engeman had a lot of land to play with, as he owned all the land east of the Brighton Hotel to Manhattan Beach, from the ocean to Neptune Avenue. Sunday, September 8, 1889, started uneventfully as a partly cloudy, chilly day at Coney Island. In the late afternoon, many people were strolling along the beach. Far off in the ocean to the south, the sky was turning from grey to black, but along the shore, the sun occasionally broke through the clouds. The waves were higher than usual, but did not appear particularly threatening. Suddenly, an immense wave swept over the pedestrians and crashed several hundred yards beyond the normal high water line. Women and children, floundering in the water, called for help as the receding water caused an undertow. The buildings that the wave had passed served somewhat to diminish the force of the backwash, and the bathers were rescued. This was the beginning of a hurricane that lashed the Atlantic coast, from Cape Hatteras to Nova Scotia, for three days. The bulkhead of piles erected the prior year at Brighton Beach prevented serious damage to the Brighton Beach Hotel, Engeman’s Ocean Hotel and the Brighton Beach Music Hall. Some small ice cream and refreshments stands closer to the water, in front of the piles, were washed out to sea. Lawns and flower beds were ruined, as they were at Manhattan Beach. West of the Ocean Hotel, the ground was fairly low, and when the high tide came in, it surged as far north as Engeman's racetrack. Water from the Coney Island Creek also poured into the track from the north. About three hundred horses had to be moved from flooded stables to higher ground. After the storm subsided, stable-hands held a race around the track in rowboats. Engeman's Bathing Pavilion was not so lucky. It still stood about 150 yards southeast of the Brighton Hotel, toward the shore. Even during the early phase of the hurricane, waves were creating a vast gulf between the Brighton Hotel and Manhattan Beach. Pavilion employees – and presumably the folks at Bunnell’s and in the Lilliputian Opera Company, as well – were evacuated by rowboat. By the second day of the storm, the raging sea had washed out the sand supporting the bathing pavilion's protective wall of piles. Some loose and were crashing against the pavilion. That night, Engeman’s Bathing Pavilion collapsed with a tremendous roar. Further back, the station and trestle of the shuttle railroad from Manhattan Beach was a mass of partially submerged wreckage. Several cars that had broken loose had been carried by the wind and water from Manhattan Beach. Most of the wreckage from Brighton Beach and neighboring Manhattan Beach washed ashore further west, where there had been some wind damage but also large accretions of fresh sand. At Manhattan Beach itself, the severest destruction was to the amphitheater along with the bathing pavilion, which was blown down and carried out to sea. Following the storm, George Engeman decided to build a new bathing pavilion about a hundred yards directly east of the Brighton Hotel. This time, however, he took Mother Nature more seriously. First, he had all of the water pumped out of a lake that had formed to the rear of where the new building would be situated. Then, he had huge amounts of dirt brought from Manhattan's excavations to raise the level of the land. Only then did he construct a brick and concrete bathing pavilion similar in dimensions and appearance to the previous one, even with the same two ramps from the upper floor to the beach. The shuttle train from Manhattan Beach was also rebuilt, east of Engeman’s new structure. The gulf that had been gouged out by the storm still remained west of Manhattan Beach and in front of Engeman's pavilion, until some years later, when large amounts of sand were obtained from elsewhere to force back the ocean. Brighton Beach, like Manhattan Beach, still relied on a traditional seaside resort model centered on the beach, bathing, dining and music. This, however, was no longer drawing the crowds that it had even five years earlier. People were beginning to want something different, like the excitement to be found at West Brighton. Brighton Beach was not finding a clear sense of direction fast enough to compete with West Brighton or even Manhattan Beach. The financial performance of Jourdan’s and Langford’s Brooklyn and Brighton Beach Railroad Company reflected this. The company defaulted on an interest payment due September 1, 1890. This time, Jourdan blamed the costs of needing to move the Brighton Beach Hotel in late 1887, along with other needed capital improvements, which together totaled a staggering $150,000. Never mind that Jourdan had known the hotel would have to be moved as he purchased it out of bankruptcy. The Brooklyn and Brighton Beach Railroad Company had never paid dividends on common or preferred, but at least had paid interest until now. The railroad entered bankruptcy shortly thereafter, with Jourdan again appointed as receiver. Jourdan was, by now, also the president of the Kings County Elevated Railway Company. He hoped to connect the two railroads to allow the latter to serve as a feeder to the former. He succeeded in doing this in May of 1894. 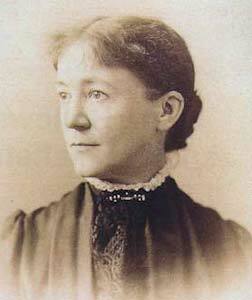 Langford stayed with the company out of bankruptcy, eventually becoming its president in September of 1896. Jourdan remained on as a company director. Cable, meanwhile, had become sole manager of the Brighton Hotel starting with the 1890 season. Over the next three seasons, Cable continued to pay particular attention to the restaurants, his area of particular expertise. In 1892, he made newspapers by acquiring and serving the personal clam chowder recipe of Daniel Webster, the noted politician and statesman who had passed away exactly four decades earlier. Clam chowder apparently was quite a big deal at the time. 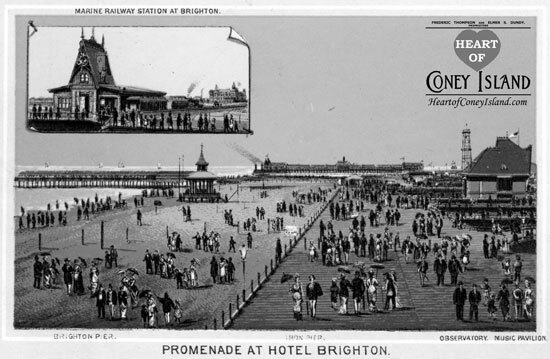 Cable remained at the Brighton Beach Hotel until another experience hotelier by the name of O’Connor acquired the lease for the 1894 season. The ongoing changes in lessees were indicative of the lack of direction at the resort. ​Seidl and his orchestra continued to attract loyal devotees at the Brighton Beach Music Hall, though never enough to make ends meet without the ongoing subsidies. Meanwhile, other venues were playing far more popular band music, with neighboring Manhattan Beach hiring the popular John Phillips Sousa starting with the 1893 season. Seidl remained at the music hall through the end of the 1896 season, when the financial strains became so apparent that he released the successor of the Seidl Society from its contract with him. That season, 850 women and 37 men attended his opening concert. In a sign of the times, the Brighton Hotel management had become so ‘stupidly disjointed’ with management of the Music Hall, that the hotel was not even open, and the ladies simply had to return back to Brooklyn after the concert. Seidl left on a tour of Europe during the 1897 season. William E. Slafer, Seidl’s replacement, replaced Seidl’s fine orchestra with his Brooklyn Marine Band. Seidl died shortly thereafter, in March of 1989, from food poisoning at a Manhattan restaurant. As for Brighton Beach’s ongoing fight with Mother Nature, already in 1890, the constant erosion of the beach was resulting in the surf reaching the new line of piles built in 1888 to shield the relocated Brighton Beach Hotel. The piles were just one-hundred feet in front of the Brighton Beach Hotel. Just the year before, the high water mark had been more than 200 feet from the hotel. Financially, it was impossible to keep up. Brighton Beach tried to keep up with the amusements scene at West Brighton. During the 1890 season, it had developed an entertainment park in back of Engeman’s Bathing Pavilion that included a bandshell and a circular building housing a carousel. A large skating rink was built for the 1894 season at Brighton Beach, along the water, immediately to the east of the bathing pavilion. Roller skating rinks had started gaining popularity during the late 1880s, particularly in East coast cities. Young, single adults found this sport a good way to socialize, and with less formalities than had to be observed in dancing. A young lady who took a spill would probably be helped to her feet by some gallant young fellow. If she responded with a polite ‘thank you’ and skated on, there would be no overt insult. If her reaction indicated that she was interested in the fellow, a relationship might develop. Of course, 'accidental' collisions were also quite common. Even if it was popular, the decision of the once-great resort to build something as common as a skating rink also served as a symbol of how much had changed at Brighton Beach in just fifteen years. 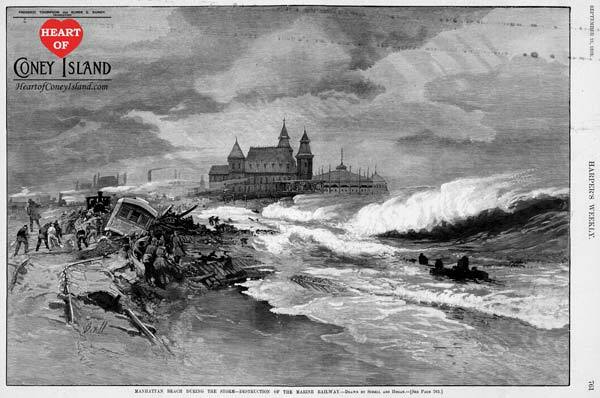 Several large storms hit Brighton Beach during the 1890s, interfering with the resort’s already cloudy future. The hurricane of Thursday, August 24, 1893, was described by a few of Coney Island's old-timers as the worst in fifty years. Waves thirty feet high rolled in for great distances, and, in some places, joined the water of the overflowing Coney Island Creek. Several hundred small structures along the beach were either blown down, washed out to sea, or carried inland to new locations. At Brighton Beach, the shuttle railroad between it and Manhattan Beach once again resembled a twisted mass of piles, ties, and rails. Engeman's Bathing Pavilion, now called Langcake's Pavilion, was damaged, as was the carousel building in the amusement park behind it. Meanwhile, at neighboring West Brighton, Balmer's Bathing Pavilion, Hotel and Restaurant, just rebuilt after their destruction by fire earlier in the year, were again totally demolished by wave and wind. During September of 1894, a storm came close to destroying the Brighton Beach Music Hall. Another storm struck just as the 1896 season was ending. Towering waves, unlike any previously seen at Coney Island, came crashing in as far as Engeman's race track, despite the wind blowing in the opposite direction. Residents agreed that if the wind had been blowing from the south, with the waves, the ocean would have washed away every building in Coney Island, including the great hotels. Before the 1897 season began, Engeman decided to move his Ocean Hotel further inland again, by another 150 feet. The location he had moved to in 1888, right after the Brighton Beach Hotel had been hauled back, was on relatively low land that was once again being threatened by ongoing erosion. He built a bulwark in front of it to protect the hotel’s new location in the event that the line of piles in front of the boardwalk was breeched by stormy waters. All of this paid for when the hotel survived a strong storm on October 19, 1898, that did the usual damage to Manhattan and Brighton Beaches and also wrecked West Brighton. In March of 1899, the Rapid Transit Company purchased the Brighton Beach Railroad Company out of receivership with the intention of reinvigorating and modernizing both the railroad and the ailing Brighton Beach Hotel. The former Brighton Line would be connected to the Rapid Transit’s larger network and also electrified, to allow for electric trolleys. The entire Brighton Hotel would have to be refurbished; all of its existing furnishings would be tossed out and replaced with new furnishings akin to those found in high-end Manhattan hotels. The restaurants would be entirely redone as well. As reported by the Brooklyn Daily Eagle, ‘With a higher class cuisine it is thought that the popularity of Brighton Beach can be built up so that it will again see the prosperous times it enjoyed some years ago’. New bath houses with electric lights and ample personal space would replace the cramped, dated ones. The company planned to dubiously reinstate ‘a high class orchestra that will draw similar audiences that gathered at Brighton during the days of Seidl, or else high class vaudeville’. All in all, the Rapid Transit Company hoped to bring back Brighton Beach’s past glory. The resort was still popular in spite of its issues, as photos of its crowded beachfront show. Armed with its fresh coat of paint and hopes for the future, the once-mighty Brighton Beach marched into battle to square off once and for all against West Brighton and Manhattan Beach during the first decade of the 1900s. The best years for Brighton Beach would prove to be the couple of years following its opening in 1878. During that period, Brighton Beach and Manhattan Beach ruled Coney Island and much of the east coast as an elegant Victorian couple. The mid-1880s would mark the start of Brighton Beach’s decline, though it remained a popular destination. By the mid-1890s, public tastes were trending towards amusement rides being developed by creative mechanical engineers. Brighton Beach tried to keep up with West Brighton, but the latter had a significant head start, was better protected from storms and had a strong entrepreneurial history. In 1907, a ban on betting in New York would hasten the declines of both Brighton Beach and Manhattan Beach. Still, the Brighton Beach resort persevered for almost another twenty years after this, until the Brighton Beach Hotel was torn down, alongside the Music Hall, in 1924. After that, only photographs would serve as reminders of Coney Island’s rise during an era when elegant seaside resorts captivated the collective mind and heart of America. The remainder of this article tells the story of the changes that took place at Brighton Beach during the last twenty years of its existence as a resort. The photograph above was taken by Irving Underhill, the famous New York City photographer, in 1905. He is standing on the observatory deck of the 300-foot-tall Iron Tower in West Brighton, facing east. In the distance, at the top of the photograph and slightly to the right, Manhattan Beach and finally the Oriental Hotel are visible. Sea Side Park is in the foreground. It was owned by the New York City government and was still relatively undeveloped. Sea Side Park is bounded by Surf Avenue to its south (running along the beach at the bottom right), Sea Breeze Avenue to its north, and Ocean Parkway to its east (which ends at its intersection with Surf Avenue). The large building in the center-left, across Sea Breeze Avenue from Sea Side Park, is the Riccadonna Hotel. The Parkway Baths is the large white building across Ocean Parkway from the Riccadonna Hotel. The smaller, darker building between Ocean Parkway and the Parkway Baths, which partially obscures the view of the baths, is Proudman's Parkway Hotel. The Brighton Beach resort complex is immediate beyond the Parkway Baths. The large open field at the left is Engeman's Brighton Beach Race Track. Its grandstand has large dark-roofed building immediately beyond the white-roofed stands. The water tower for the Brighton Beach Hotel is the dark cylinder on stilts in the upper center of the photograph, beyond the race track. Tents for the Boer War are in white beyond that. The Brighton Beach Hotel itself is difficult to see at this scan resolution, and it is immediately right of the water tower, partially obscured by the large white building, which is the Brighton Beach Music Hall. The skating rink and baths are east of the hotel and not visible from this angle. For additional perspective, see the Harper's Weekly 1905 Map. The Brighton Beach Hotel was not the only hotel on the Brighton Beach side, or east side, of Ocean Parkway. George D. Bader's Grand Central Hotel stood where the end of the Parkway intersected with the end of Surf Avenue. Bader's hotel had been operating for decades. In back of Bader's Grand Central Hotel, and facing the ocean, the Parkway Baths had opened for business in 1900, with almost 3,200 locker rooms. The building burnt down some years later, and was replaced by an all-concrete structure. 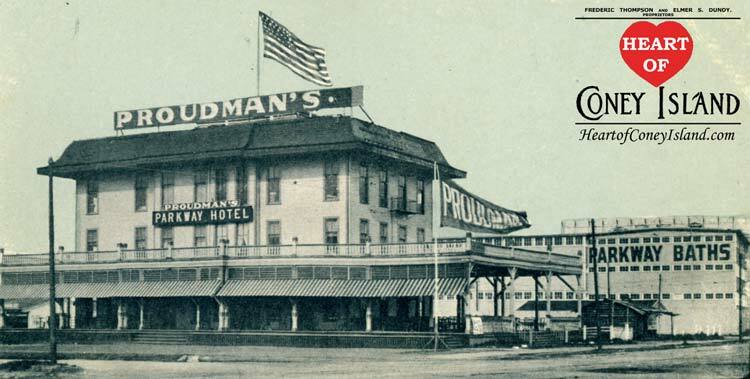 After Bader's death in 1903, the building was acquired by John C. Proudman, who renamed it Proudman's Parkway Hotel in 1904. 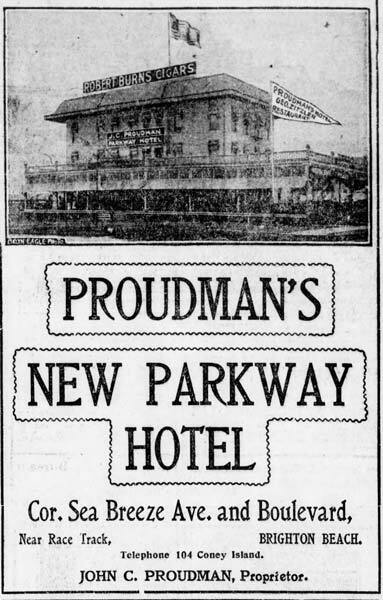 Around 1907, Proudman's Parkway Hotel was demolished to make way for an all brick building in which Reisenweber's Brighton Casino, a restaurant, was to open in 1909. It had beautifully arched windows on the main floor, and a veranda for outdoor dining on the upper story. There was a Reisenweber Restaurant at Columbus Circle in Manhattan, and this was to be a Coney Island branch. Around 1907, construction began on a new, all brick theatre next to Reisenweber's, on the west side of the latter's restaurant. 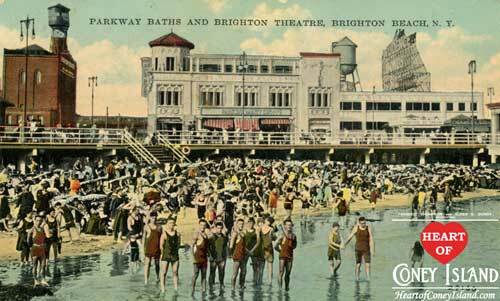 This New Brighton Theatre, also called the Brighton Beach Theatre, opened in 1909. It was designed primarily as a variety, or vaudeville, house. Every theatrical personality of any consequence performed there at one time. This theatre was the Coney Island equivalent of the Palace Theatre on Broadway, which was Manhattan's mecca of vaudeville. On the west side of Ocean Parkway, opposite Proudman's, where Dieter's Hotel once stood, a new, spacious, brick and frame hotel was erected, and opened for business in 1904. It was from three to four stories in height and covered a square block bounded by Ocean Parkway, West Brighton Beach Avenue, West 1st Street, and Sea Breeze Avenue. When it opened, it was called the Concourse Hotel, and in 1905 it was renamed the Riccadonna Hotel. In 1911, the name was changed to the Jefferson, and it became the Shelburne Hotel in 1914, which name it retained until its demolition in 1928 to make way for the apartment house now on its site. 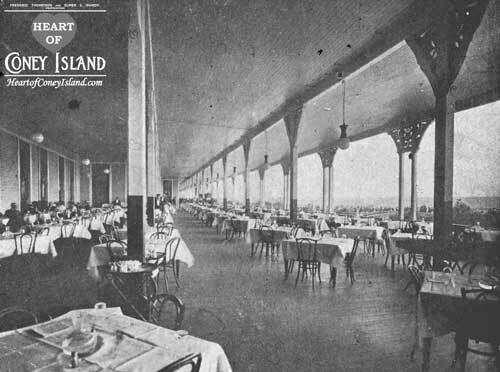 On its main floor was a restaurant in which 1,400 people could be served at one time. There was a large dance floor in the restaurant, with Eben's 71st Regimental Band providing concert and dance music. In later years, it had one of the best jazz bands in Coney Island. Though it did not have the extensive acreage available to the swanky hotels to its east, its accommodations were on a par with the best of them, and it was open all year. Among the prominent people that checked in there was the Spanish-American war hero, Admiral George Dewey. William Brady, the enterprising showman who had managed the now-defunct Coney Island Athletic Club, had obtained the bicycle concession at Manhattan Beach and now decided to make a move into Brighton Beach as well. For the 1905 season, Brady set out to give Pain's Pyrotechnic Shows at Manhattan Beach a run for their money. Brady got together with some other gentlemen of means and arranged with William A. Engeman, son of the founder of Brighton Beach, to build a stadium in the Engeman Park that would seat over 25,000 spectators. Brady decided to put on an elaborate show called The Boer War. The actual Boer War, between the Dutch of South Africa and the British, had occurred from 1899 to 1902, and had ended with a British victory after earlier disasters. It had been front page news in America, with many Americans sympathizing with the Dutch, who seemed to be fighting for independence from Britain as the Americans had done in colonial times. In 1904, Brady visited the St. Louis Exposition which commemorated the centennial of the Louisiana Purchase. He was impressed by a show there in which dramatic events of the Boer War were reenacted by participants of the conflict, and he arranged to have the show appear at his new Brighton stadium for the 1905 season. He also engaged some of the heroes of that war, such as De Wet and the Boer general, Cronje to take part in the battles. The Boer War show was a financial success, but it gave Brady many headaches. There were about 500 British and Boer veterans that arrived in Brighton before the season began, and when the British heard that Jacob Henden was in the Dutch contingent, they notified Brady that they would not participate if Henden were in the show. He was said to have led guerrillas in blowing up British hospital trains during that war. The Boers in the company informed Brady that if Henden were excluded, they would not take part in the show. An agreement was worked out whereby Henden would not participate, but would receive full pay. There were also difficulties in getting the British and Dutch to reenact engagements which showed them being defeated. Between performances, the Boer Was continued in the saloons of Coney Island, with fists, bottles and chairs being used, instead of bullets and bombs. The show did not last beyond the 1905 season at Brighton Beach. Engeman decided to bring in Pawnee Bill and his Wild West show to the Brighton stadium for the 1906 season. Pawnee Bill was a noted Indian scout for the United States Cavalry. Among the hair-raising scenes was an Indian attack against civilians in a wagon train formed into a defensive circle. Just as the Indians were closing in for the kill, a bugle sounded, and in would gallop the United States Cavalry. The Indians would flee, with the cavalry in pursuit. Meanwhile, at the Brighton Music Hall, in 1906, 'Gentleman Jim' Corbett was busy doing the vaudeville circuit, performing in a sketch called The Burglar and the Lady. Jim Jeffries, his boxing nemesis, was likewise involved in a piece of schlock called Davy Crockett, as a strong and silent type. Clad in buckskin and fur hat, Davy, in one scene, takes on three attacking Indians, and dispatches them with his fists. The Indians are some sparring partners of his, and adept at taking a dive without making a splash. William Randolph Hearst ran against Charles Evans Hughes in 1907 for governor of New York State. Hearst, that apostle of virtue, ran on an anti-gambling plank, which cost him the election. Hughes, who later became a Supreme Court Justice, showed what he thought of representative government by double-crossing his supporters, in getting those other peoples' representatives in the New York State Legislature to outlaw all forms of gambling, including pari-mutuel betting at racetracks. In New York City, a law was enacted making all governing bodies of racetracks liable for gambling on their premises. Horseracing could not function at Coney Island without betting. The tracks needed income from the pari-mutuel betting, as well as from the attendance, to pay the purses that would attract the best horses in the country. Without horse racing, the Brighton, Manhattan, and Oriental Hotels would remain mostly empty, for they depended mainly on the patronage of the horse owners and wealthy sportsmen to fill the hundreds of vacant rooms in their establishments. Unable to withstand the pressure by the reformers anymore, Engeman discontinued horse-racing at his track in the 1908 season, switching to auto and motorcycle racing, which didn't have the evil connotation associated with horses and jockeys. Automobile races had first been presented at the Brighton Beach Race Track in 1902, at times when the horses were not running. The other two tracks continued with horse racing until 1910, when they also switched to motor racing. In 1911, the Gravesend track was demolished, followed shortly by Engeman’s. Within a year, summer cottages and year-round dwellings were arising on the sites of the two tracks. The racetrack at Sheepshead Bay continued in operation until 1917, when its auto racing was ended, and it was demolished to make way for housing development. Just before Engeman tore down his track, he proved that he was a true Coney Islander. He learned that the Brighton Railroad had some old locomotives and railroad cars that were about to be scrapped. He arranged to have a temporary spur built from the railroad into his track, then announced to the public that there would be a head-on collision between two trains, and those who wished to witness the event that they would never again be able to do in their lifetime, could do so for the slight charge of a dollar. On that auspicious occasion, the Brighton track had the highest attendance in years. Dummies were placed in the cars to make it appear that people would be killed, which thrilled the onlookers. After the locomotives were set in motion, their engineers jumped clear of them. Both trains gathered speed as they circled the tracks, then headed for each other, and struck with an explosive impact. The locomotives seemed fused into one steaming mass of twisted steel, while the cars behind them were tossed about in all directions. The crowd was permitted to approach to within a safe distance in order to observe at close hand the crushed, mangled and dismembered dummies. It was all very educational, and Engeman emerged from the disaster thousands of dollars richer. In 1910, a massive steel roller coaster went up next to the roller skating rink. Later, in 1918, it was purchased by and moved to Luna Park. 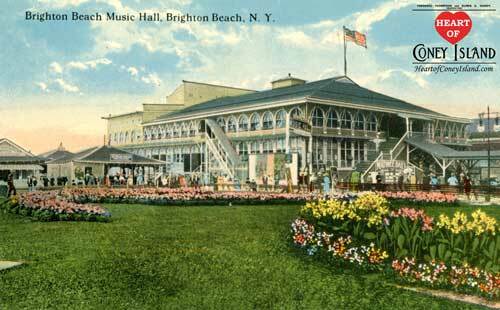 ​The Brighton Beach Hotel and the Brighton Beach Music Hall lasted until 1924, at which time both were demolished to make room for the Riegelmann Boardwalk. This left the New Brighton Theatre on Ocean Parkway as the only house in the area showing variety acts. Engeman’s all-concrete Brighton Baths bathing pavilion was also torn down at around the same time. Like the Brighton Hotel, it had had a restaurant and bar. The Prohibition Era that began in early 1920 deprived the hotel and bathhouse of this vital source of income, which had kept its ledgers in the black. Additionally, courts had also ruled that beaches were public property, and bathhouse owners along the beach had to remove fences enclosing their sections of the beach. This reduced the exclusiveness of the baths versus public baths. And lastly, the new boardwalk that had been completed in 1923 from Sea Gate to Ocean Parkway was to be extended through Brighton Beach, after the existing, narrow boardwalk there was be demolished. The path of the new boardwalk extension would cross almost in front of the Brighton Baths. In its place, several thousand outdoor lockers were built on the northwest side of Engeman's amusement park. As a new section of Brighton Beach Avenue was being extended from Coney Island Avenue to Manhattan Beach, thereby transecting Brighton Beach Park, the area north of the new avenue, which contained the stadium and the Giant Safety Coaster, was leveled to make way for residences. Brighton Beach Park was now confined to the south of the new avenue, and offered a carousel, a Thompson Scenic Railway ride, and several miscellaneous attractions, in addition to its bathing facilities. 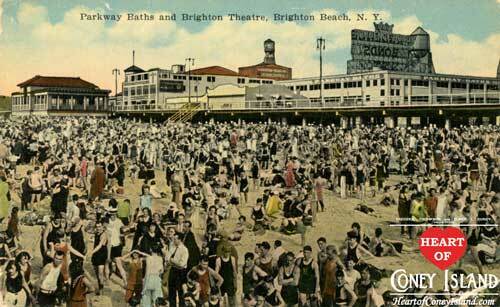 Brighton Beach's era as a resort had, more or less, finally come to a close. The manuscript's contents are used, modified and published under an exclusive copyright license dated 2016. All rights reserved.